Alcázar de Segovia is a castle located in the city of Segovia in the Castilla y León region in Spain. The castle served as one of the inspirations for the castle of Cinderella and has gained even more popularity because of this fact. The structure rises above two rivers on a rock and its backdrop lined by the Guadarrama mountains. 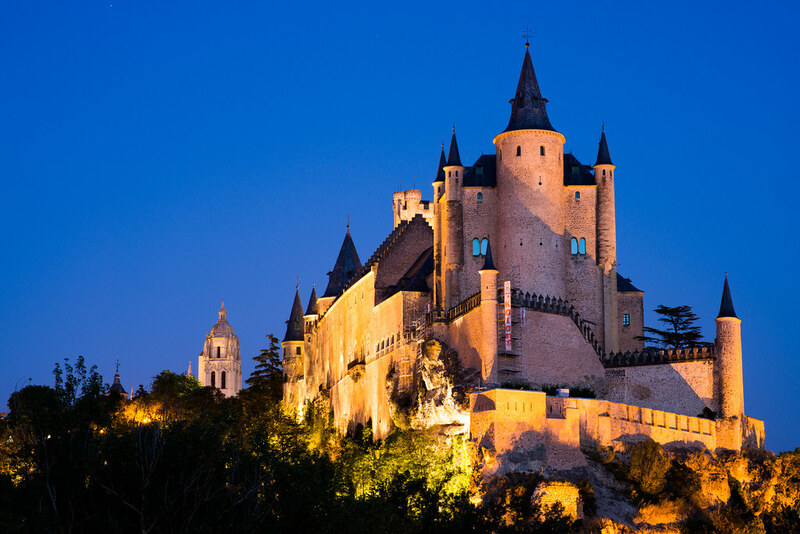 The castle is, irrefutably, one of the most beautiful in Spain, if not the whole world. Today, the castle is used as a museum and to store military archives. However, before becoming what it is today, the castle was used for many purposes: from being an Arab fortress to a state prison to a royal palace to a military academy and even a college. The original interior of the castle was damaged by a fire in 1862 but has been almost entirely restored. Notable rooms to visit are the Hall of the Throne, the Hall of the Kings, and the Hall of Ajimeces.